What Does it Take to Turn an Old Boat into an Ocean-ready Passagemaker? What does it take to turn an old boat into an ocean-ready passagemaker? That was the question facing my father, Dennis, when he decided to fulfill a decades-old dream of crossing an ocean aboard his own boat. What does it take to turn an old boat into an ocean-ready passagemaker? That was the question facing my father, Dennis, when he decided to fulfill a decades-old dream of crossing an ocean aboard his own boat. His 1986 Wauquiez Hood 38, Sojourner, is his seventh boat, but the first he will take offshore, as he sails in this year’s ARC Caribbean 1500 Rally. 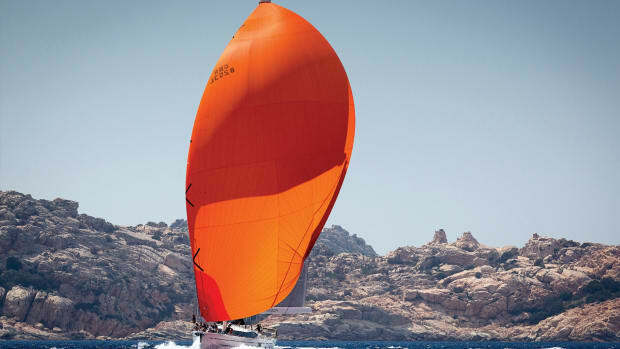 The Wauquiez Hood 38 was designed by Ted Hood, as the name implies, and was based on the Bristol 38.8 and Little Harbor 38. The hulls are identical, with a modified full keel/centerboard and skeg-hung rudder below the waterline. Above the waterline, the Wauquiez has a more European appearance, with higher freeboard, a lower coachroof and much less wood trim. Sojourner is a Mk I Hood 38, with a steep Swan-style companionway amidships. She is sloop rigged with a high-aspect-ratio mainsail on a mast that stands 50 feet above the deck, and a big overlapping genoa. 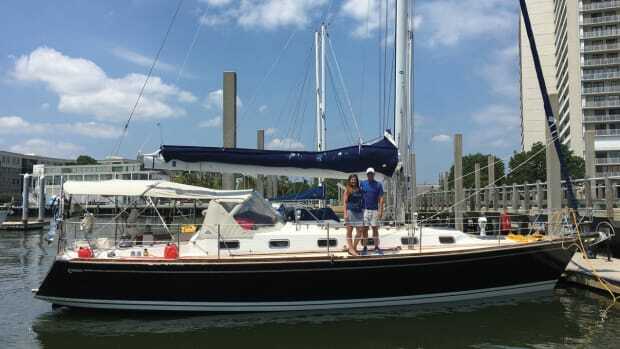 When my parents bought Sojourner in 2006 she was simply equipped, which was fine for sailing the Chesapeake. The old B&G Network electronics suite (including the autopilot) was not functional—which was a shame, for in its day it was top-of-the-line gear—but the Trimble GPS in the nav station worked just fine. 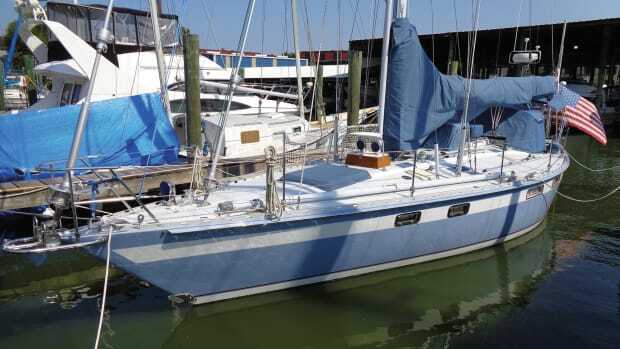 Although we’d replaced the old fridge with a new Seafrost unit, the boat otherwise remained pretty much as we bought it for five years of cruising on the bay in the summertime, with me occasionally living aboard. She’s a good sailing boat, though with her heavy displacement and seaworthy accommodations she is better suited to bluewater conditions. Although not too fast in light conditions, she is great in a blow. My mother passed away in 2012, and in April this year my father decided to commit to sailing in this year’s Caribbean 1500. He couldn’t have started any later, that’s for sure. Every major system on Sojourner needed an overhaul. In hindsight it would have been easier and mellower (though not necessarily cheaper) to refit the systems one at a time over the course of a number of season. What’s suitable for summer on the Chesapeake is a far cry from what’s suitable off Hatteras in November. Over the years I’ve developed some contacts in the sailing world, particularly in Annapolis, and have acquired some skills, so I did all I could to help my dad along the way. I once worked as a rigger with Mike Meer at his Southbound shop at Port Annapolis Marina, so that’s where we started. 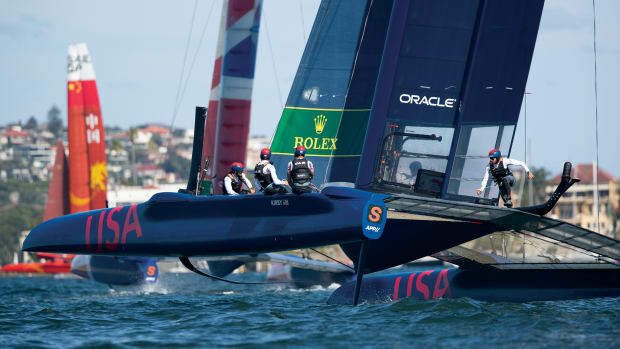 (Keeping the water out and the rig up are your two most important priorities when sailing offshore.) We ordered a new Harken Mark IV roller furling unit and new standing rigging, with swage fittings aloft and Hi-Mod compression fittings we could install ourselves at deck level. We pulled the chainplates for an inspection, saw they were okay, and put them back in. My father and I have each sailed a Saga 43 with a Solent rig on separate Atlantic crossings, and we agreed the rig works well offshore. A big genoa set on the forestay is complemented by a smaller headsail set on the Solent stay, affording different options offshore as the breeze goes up and down. Nine times out of 10 with this setup you’ll avoid having to partially furl a headsail, which never sets quite right. Plus, attaching the Solent stay near the masthead avoids the need for running backstays. With Meer’s help, we designed and built a removable Solent rig for Sojourner, installing a heavy custom chainplate at the bow to support a 9mm Colligo Dux fiber stay, on which a small hanked-on 90 percent jib can be flown. Contrary to popular belief, fiber stays can stand up to bronze hanks, as long as they are new and smooth. Soft hanks are difficult to fiddle with offshore, but bronze hanks are quick, easy and can be handled with one hand. The stay, being fiber and not wire, is easily removed and can be tied to the mast when sailing inshore. To complete the sail-handling system we installed a new Harken Big Boat traveler, added secondary winches and rope clutches in the cockpit for handling spinnaker sheets, and preventers and guys for the boom and whisker pole. Meanwhile, Chuck O’Malley at Doyle Sails in Annapolis built a new fully-battened triple-reef mainsail to hoist on a Tides Marine Strong Track. 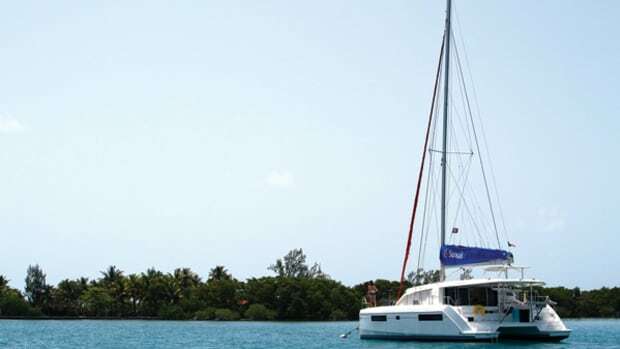 The total cost of the rigging project, new mainsail included, topped out at $6,000. Aside from the aforementioned fridge, the electrical system was in dire need of a makeover. Admittedly, it wouldn’t make the boat safer or easier to sail, but it would certainly make living aboard easier.  He and his guys at Marine Electric Systems started out by installing a new Garmin autopilot. (I couldn’t talk my dad into a windvane, which I prefer offshore for its simplicity.) 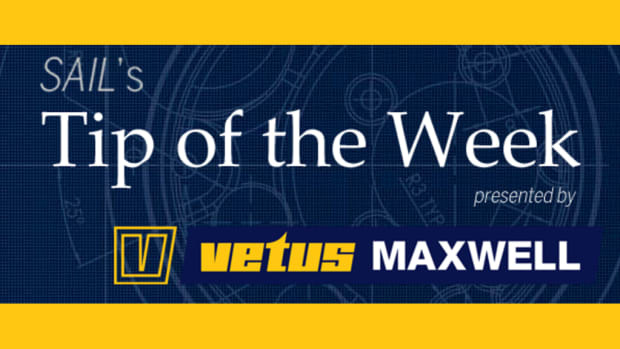 They then spent the next week installing a new 400Ah AGM battery bank, a new electrical panel, new battery switches and a Philippi battery monitor, all of which cost just under $20,000—half of which was labor; when you see the quality of the work, it makes sense. This was the only area on the boat where neither my father nor I felt competent enough to do a professional-level job ourselves, so we paid a premium and had it done right. If it were my own boat, I would have saved money by using wet-cell batteries of the same type and capacity. “Best bang for the buck,” according to Campbell, but they do require maintenance. One thing Dad and I did install on our own was a new Standard Horizon VHS/AIS combo unit, which receives but does not transmit AIS data. We also put in a new Garmin mini-chartplotter to replace the old Trimble unit at the nav station. Dad is going without SSB on this trip, which will isolate him a bit within the Caribbean 1500 fleet, as he won’t be able to participate in the radio nets, but he deemed it a luxury and left it off his list. Despite the mounting cost of the refit, Sojourner remains a pretty simple sailboat. Her original purchase price was just shy of $80,000, so my father is actually doing pretty well in terms of total expenses. Throughout the process we’ve placed an emphasis on the “essentials” and keeping the boat simple, easy and fun to sail. The boat carries 100 gallons of water in tanks (no watermaker), with foot pumps to conserve both water and electricity at sea. There is also a saltwater foot pump for doing dishes and cooking offshore, something I deem essential at sea. Sojourner is small enough that she doesn’t require electric winches. She also has a manual anchor windlass. I spliced all new running rigging (New England Ropes StaSet for the sheets and 11mm VPC for the halyards), which makes line-handling a pleasure. Reefing and hoisting sails is still done at the mast—the only lines in the cockpit are sheets, which is as it should be, in my opinion. On Meer’s advice, I also installed Dyneema preventer messenger lines on the boom and fitted Dyneema lazy jacks. The complete sail inventory will include the mainsail, a 150 percent genoa, an asymmetrical cruising chute with a sock, a 90 percent jib and a hank-on storm jib. This wardrobe makes for ease of handling in all conditions, and gives Sojourner a good turn of speed in light air. The headsails, including the spinnaker, all came with the boat and were deemed in good enough condition to take offshore. Last but not least, complying with the ARC Caribbean 1500’s stringent safety regulations required a few more purchases, including SOLAS flares, new lifejackets and a repacking of Soujourner’s Switlik liferaft. 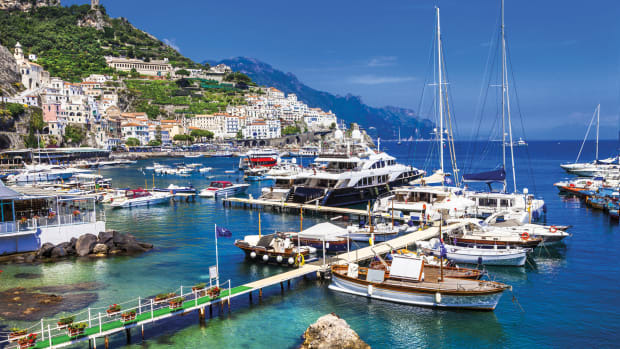 (To download the full checklist of regulations, visit worldcruising.com.) To first-timers, this might seem excessive or redundant (it’s certainly expensive), but after spending some time at sea on different boats and in different conditions, I now insist that all this gear be carried on any boat I deliver, rally or not. That stuff is required for a reason, which is difficult to comprehend until you’ve been offshore in nasty weather. Sojourner by now is a proper ocean sailing yacht. We focused on the essentials first—the rigging and sails, the single most important aspect of an ocean-going yacht, aside from the hull itself—and added the luxuries based on my dad’s (now admittedly blown) budget. In all he spent about $50,000 on the refit, bringing the grand total of the project, purchase price of the boat included, to just over $130,000. The boat is far better equipped than most any boat on the brokerage market at that price, and it’s fitted out precisely as he wants it. He’ll set off this month in the Caribbean 1500 to put all that effort and money to the test. A winter cruising in the Caribbean will be his reward. Andy Schell is a yacht captain and writer.